Hampshire’s website, www.hampshire.edu, was moved over to the Drupal platform last Tuesday, July 8. Prior to this move, content authors had been using RedDot content management system to edit content on the website. We made the decision to switch last year and we chose Drupal for a number of reasons. In addition to working on other projects, Hampshire IT and communications staff have worked hard over the last year to learn Drupal, build a Drupal installation to fit our needs, and prepare the website content to be moved automatically into this new system. We worked with Drupal experts from Palantir.net to help guide us in this process, and we also received some great advice from our colleagues at Mt Holyoke who went through a similar migration process in the past. The website looks almost exactly the same! The plan was to implement our existing design in Drupal, and that’s what we did. The biggest change is that we were able to retrofit our existing design to be somewhat responsive. This means that the website should be easier to use on devices like mobile phones, which is a big deal because mobile web traffic just keeps increasing over time. The other big change is for our content authors. Everyone updating content on the website needed to be trained on Drupal. We are still in the process of training content authors, but many staff who have already been trained have indicated that they like the new editing interface that Drupal has to offer. Over the next couple months we will be working on changing the design of the website a bit to reflect more modern web standards. This will not be a big redesign by any means, but we will be implementing some changes like wider page content and being able to display more content on the homepage. Drupal has an abundance of features, some of which allow for content to be displayed on multiple pages, and in different ways, in an efficient manner. We will also be working on setting up these mechanisms to make it easier for our content authors to display information on the website in more visually appealing ways. There will likely be a large redesign of the website in the future, which will include a cohesive process of discussion and organization around Hampshire’s identity and communication strategy. Conversations are beginning to happen around what this process might entail, but a project has not yet been put into action on this front. Hampshire College has been using the RedDot content management system since 2007 to maintain the college website. Technological advances make it both necessary and desirable for Hampshire to migrate to a new content management system. We will automatically move content from the existing Hampshire website into Drupal, so they will not have to do that themselves. This means that everyone should keep updating content as usual and NOT wait until Drupal is in place. We will provide training sessions in 2014 for them to learn how to use Drupal. Drupal’s interface will be different from RedDot, but we think that our content authors will find it to be a significant improvement. IT and communications staff are in the process of learning Drupal, setting up the system structure, and planning the content migration. As we move forward we will have a better idea of what our migration timeline and training schedule will be like and we will be in contact with our content authors as we progress. If anyone has questions or feedback about this transition, please send them to webmaster@hampshire.edu. We are also getting ready to teach a series of classes on Agile project management; stay tuned for details! In a few weeks, we will introduce the first changes to TheHub to move towards the BetaHub design developed working with students and faculty. Most importantly we want all faculty to understand that the changes you will see around April 1 are only the first step in a series of changes designed to help both students and faculty better navigate Hampshire’s unique academic program. The navigation, or how you get around, has been vastly simplified. Instead of clicking from a long list of possible items, you choose what you want to see from a few simple tabs at the top: your Courses or your Advisees. 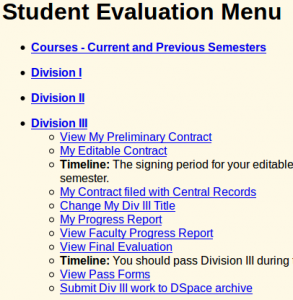 Once you have selected a specific course or advisee, you can view details or take action such as sign a contract or write an evaluation. 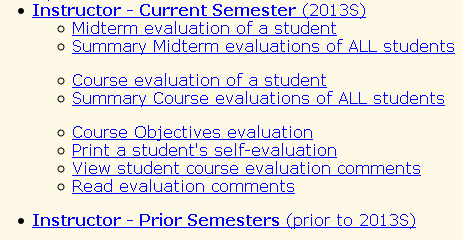 The content previously found under “Current Courses” and “Previous Courses” is all now located under the “Courses” tab. 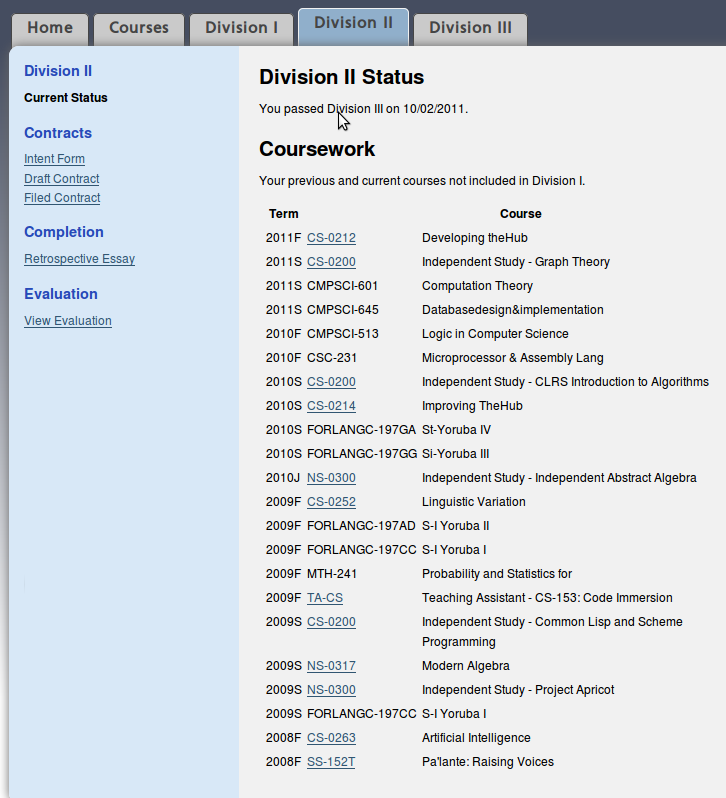 When you click on it, you are presented a list of current courses, but you can use the filters on the left to view any course (past, present or future). 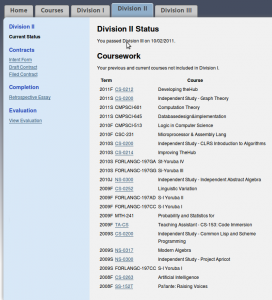 Moreover the course listing itself is will provide you useful information. The color-coding and format of the lines will quickly alert you that you have something to do (eg: write a missing evaluation, etc). 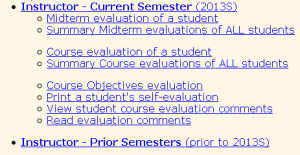 The content previously found under “Adivsor” and “Division 1-3” is now located under the “Advisees” tab. 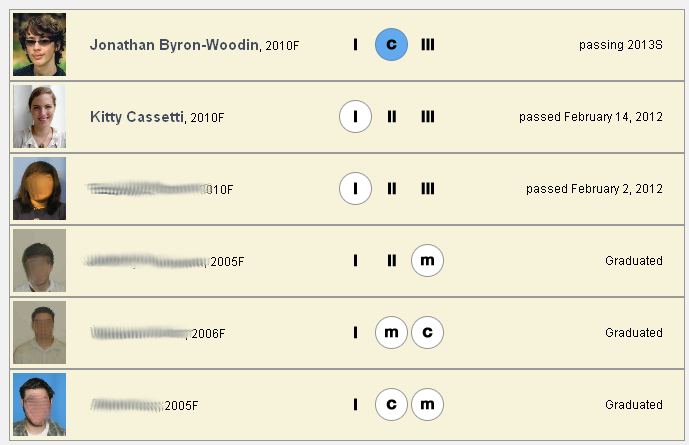 When you click on it, you are presented a list of current and prospective advisees, but you can use the filters on the left to view any advisee (past, present or future). 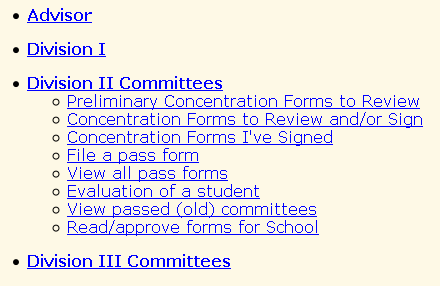 Additionally, the advisee listing will provide visual indicators (both with symbols and colors) indicate if/when you have some action pending, such as a Div II or III contract awaiting your signature. We will continue with a series of blog posts to update the status as we prepare to release these changes to faculty. Stay tuned for more updates shortly. In just a few weeks, all Hampshire students will begin to use TheHub 2.0, the first in a series of steps to reinvent TheHub. 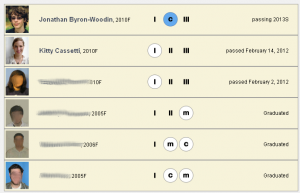 This first iteration will introduce changes to the navigation and menus students use to access and write evaluations. The old, outdated display (at right) is finally going away to be replaced with something that’s far easier to use. Who will see these changes? The changes affect all students, but those who entered Hampshire since Fall 2011 likely have not seen the old menus so this may not seem new to some. 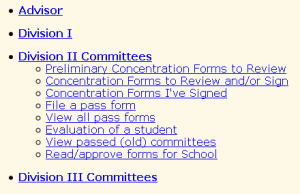 Regardless, we have vastly improved the site navigation by introducing tabs tied to your most common activities: Courses, Div I, Div II and Div III. 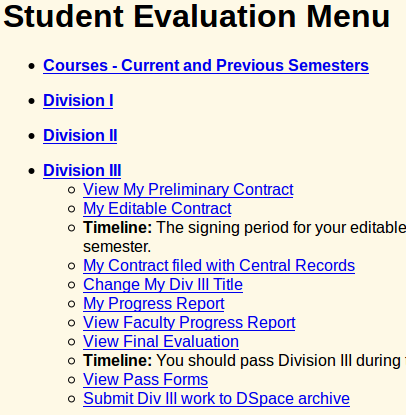 You can view and write all course evaluations under the Courses tab, and view/edit your forms for Div I and contracts for Div II and III under their respective tabs. Is this be tahub? What is betahub?